Iwan Pranatio Shihan- with Goshi Yamaguchi Hanshi Anglesea Victoria. Shihan Iwan Pranatio (7th Dan Kyoshi) is one of the most highly regarded teachers within the IKGA in Australia. He first began Martial Arts training in Judo many years ago prior to studying GOJU KAI KARATE-DO . However his karate training commenced in 1970 with the International Goju Kai Karate-Do Association in Indonesia. After a number of years, (in 1975), Iwan Shihan moved to live and study Goju-Kai Karate-Do in Japan under Gogen Yamaguchi Kaiso, Founder President and Grand Master of I.K.G.A. and also under the tutelage of Kaiso's son Saiko Shihan Goshi Yamaguchi and many other senior Shihan's and senior Sensei. 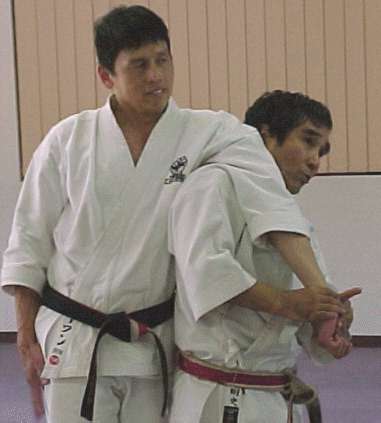 He is pictured here with Goshi Yamaguchi Shihan on one of his many tours of Australia to teach Australian members of Goju Kai.This technique is an application from Kata Sepai. Throughout the years, he has also competed at various tournaments and attended seminars throughout Japan, Okinawa, Indonesia and India. After teaching Karate-Do in Australia for a number of years, Iwan Shihan was awarded his 7th Dan and promoted to the position of Chief Instructor of Victoria for I.K.G.A. Iwan Shihan is married to Misako and they are living in Victoria whereby Iwan Shihan is currently teaching at the Kew Dojo, Melbourne, Australia and attends various Pacific tournaments and seminars as an Official. Whilst residing in Japan Iwan Pranatio Shihan also studied in the Art of Kobudo (weaponry) for a brief period of time. After many years studying at the Japan Karate-Do College as a student /instructor of the Goju Kai Karate-Do Organisation and running a Dojo in Japan, he Graduated from the College August 5th, 1978 as a Sandan . Iwan Shihan was graded to the Rank of 6th Dan (Rokudan ) Renshi Shihan in 1990, and in October 2003 to 7th Dan Renshi at the Sydney Goju Kai Seminar, by the President of IKGA Goshi Yamaguchi Shihan, and endorsed by IKGA Vice President Paul Starling Kyoshi.